So today is Saint Patrick’s Day, the day that the Irish and the Irish wannabe’s celebrate a Roman Catholic priest who died on March 17, 461 AD. Now I do not wish to get into all the history of Patty’s special day, for anyone who wishes to can read that almost anywhere. Nor do I wish to be a party-pooper and rain on the parade, but I am amused by a couple of things surrounding the day. I am amused by the fact that though it had its roots in the religious, it is perhaps more a cultural event today that it ever was a religious one, and certainly more than it ever was in any way a Christian event. I am amused by the fact that the shamrock, which is so synonymous with the event, was used by Saint Patrick (according to tradition) to explain the Trinity to those whom he sought to evangelize. I wonder how many revelers of the day who host the shamrock think of it as the old priest did? Hmm, probably not too many. However, I am amused mostly by the fact that it is celebrated in the middle (more or less) of Lent. Why does this amuse me? It does because traditionally for many Lent was a time to fast and restrict oneself from food and alcohol, and way back in about the 17th century Saint Patrick’s Day essentially became a feast day in which, among other things, alcohol restrictions were lifted for the day. People used to ask me what I was "giving up" for Lent. I'm tempted to ask if for Saint Patrick's Day they're "giving up" Lent? (Yes, I'm being facetious; grin, grin). I wonder what old Patrick would think of that? Hmm, probably rolling over in his grave right now. Obviously events and traditions evolve, and I certainly am not interested in building any form of argument one way or another on the subject. These are just a couple of my humble musings. 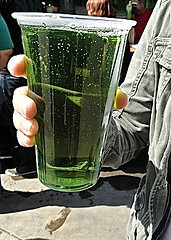 How about another pint of green beer, Patty?